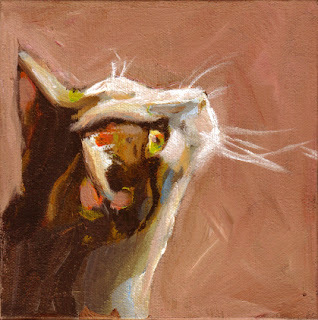 "Pink" - 6 x 6" acrylic on gallery-wrapped canvas. I was contacted last week by a couple that wanted to purchase five paintings. They gave an address in England. I received a cashiers check today - for far more than the amount of the paintings and shipping- and thinking it was fishy, took the check to the bank to have it looked at. About 30 minutes of sleuthing later, they came back with the information that it was indeed a phony check. The couple was using the names Kelly and Frank George and claiming to live in London and Alabama but the check was from a bank in Maine. Hey, they had good taste at least. You may have already heard about this scam -- it's been around for as long as there have been cashier's checks -- but if not, be wary. There will always be people trying to get something for nothing. Which brings up an important topic for artists: security and money. I generally like to follow ten important rules on this front, and I'll share them with you here. 1. People are evil. Okay, perhaps not all evil. But for every innocent Adam out there minding his own business, there is definitely at least one Eve who is not only going to bite into that apple, but convince some other schmuck to bite into it too. Just realize that there are more Eves out there than a friendly person would like to think, and keep your apples close. 2. Get it in writing. It doesn't have to be in the client's own blood or anything, but definitely ink, and definitely signed. If you're doing a large commission with a new client, you'll both be a lot happier if you have limits set and on paper for the world (and any courts) to see. 3. Get it up front. Thou shalt not set pen to paper until thou have received a deposit. I didn't use to do this. Then I had an Evil Person commission a work and never reappear to take it or pay me. Oh, I weep for my lost innocence. 4. Money's money except for when it isn't. Cash is pretty much always cash. I suppose someone could slip you counterfeit bills but I haven't heard of it yet. Checks, believe it or not, are almost always money. I know it's easy to give someone a bad check, but I've never gotten one. And considering the number of times I've been paid with a check, that's pretty good odds. But money orders and cashier's checks . . . wait until your bank smiles over them before releasing any paintings anywhere. And since they're the most scam-worthy currency, turn on Ye Olde Gut Feeling when deciding when to accept them as payment. 5. Keep receipts. From the post office, the art store, the bank, the costume rental place . . .
wherever you spent money for your art, keep the receipt for Mr. Tax Man (who definitely falls onto the Evil side of the population, especially if you cross him) and also for clients. If someone quibbles over how much they paid for shipping (and this does happen, because people assume you're Evil too), you want to be able to show them the receipt from the post office, saying that it really did take $90 to ship that ceramic baby hippo that you mailed to them. 6. Have a credit card or debit card from a purely business account to buy things. It's easier to keep track of things, you feel really important when you say "put it on my business card, would you? ", and life in general will be rosier with more cupids flitting about. 7. Make all your art purchases at one time. Shipping costs can add up faster than calories on a donut spree, and it will make a big difference to your overall budget if you can both cut shipping costs and get bulk discounts on items like frames and paper. 8. Watch out for your clients' well-being. If you have a client who loves to buy but her desire outstrips her budget, think about talking with her about it. I've had clients who loved my art but they bought so much they couldn't even hang it on their walls. The idea of it stacked somewhere in their house . . . that's not what art is for. Leave your clients feeling good and guiltless about their purchase and they'll come back to you later -- and recommend you to their friends. Talk them into a higher priced piece and they'll regret it like that Mercedes they bought last year. 9. Be quick to offer refunds on your mistakes. If you overquote shipping, offer to refund or give a credit. If they accidentally paid twice, get on it like a tacky button down on a computer geek. Even if they refuse, they'll know you're honest. Every step you can take to convince them you're an Adam and not an Eve will be one closer to repeat business. 10. Reward yourself. We're starving artists, I know. We hoard. It's what we do. But when you make a great sale or you sell a piece you've been dying to sell . . . reward yourself. Just a little splurge, and you'll feel motivated to both pay the electric bill and paint the next big seller. Great advice, Maggie. When something seems to good to be true, it probably is. Pink is very cute. Clap Clap Clap, hear hear. Excellent advice, Maggie. Thank you!